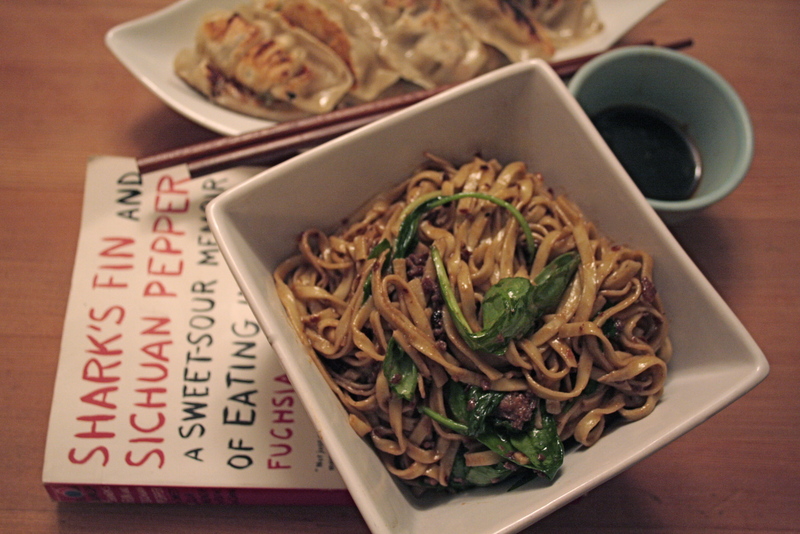 dan dan noodles in a firey sichuan sauce | eating with S.O.L.E. So back to the face burning… I will admit I adore heat, and while I may day dream through a fiery curry often my partner is drowning in sweaty brow and struggling to form a sentance… So I am going to write this recipe how I think it might be more tolerable to the masses, and indeed how I will make it next time (for my family).. but for the brave, and heat intollerant I will denote how Fuchsia shares Xie Laoban’s original dan dan noodle recipe. the recipe also calls for salt to taste.. but I found it salty enough for a salt lover like me. Once the noodles are ready toss into pan with meat and fry rapidly, add the sauce as well as three handfuls of spinach toss and fry. Serve hot with some nice steamed veggie pot stickers. And try to keep your face attached! Mmmm I really enjoyed this dish.. as I never would have put this together myself. I am looking forward to more Sichuan adventures in my future.